This may be the way we stop the antibiotic resistance pandemic. When Alexander Fleming discovered penicillin in 1928, it was one of the world’s first true antibiotics to ever be successful in eliminating infectious disease. Since then, antibiotics have been essential to preventing avoidable deaths. But a troubling reality faces us all. Throughout all of Earth’s evolutionary history, multicellular organisms have continually changed and adapted. But unicellular bacteria evolve so quickly, that a majority are now resistant to a wide array of antibiotics. The problem of antibiotic resistance is so serious, that the United Nations placed it at crisis level along with HIV. As a response, scientists have taken on the challenge to solving this global pandemic. One group of scientists from Oregon State University (OSU) recently discovered a weapon in fighting antibiotic-resistant bacteria. Their findings were recently published in the Journal of Antimicrobial Chemotherapy. These scientists found their answer inside a peptide-conjugated phosphorodiamidate morpholino oligomer (PPMO) molecule. They believe that this molecule could combat an enzyme produced by bacteria called New Delhi metallo-beta-lactamase (NDM-1) which is responsible for coding resistance along with several other genes. Since the genes are shared across many different types of bacteria, only one PPMO molecule would be needed to fight the resistance. It would make contact with the antibiotic and restore its ability to fight bacteria that express NDM-1. In the study at OSU, the scientists used an antibiotic called meropenem, which is an ultra-broad-spectrum drug of the penicillin-type carbapenem class. Meropenem was effective in treating mice that were infected with E. Coli that was found to be NDM-1 positive. Testing for humans is slated to begin in about three years. 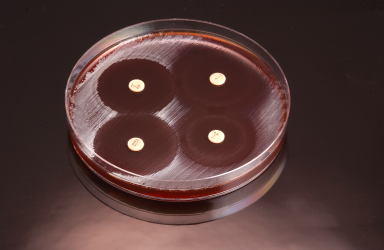 If proven to be successful, this discovery would make it possible to treat a wide array of bacterial infections and diseases without life-threatening difficulties that antibiotic resistance can create. But as Geller stated, bacteria could quickly evolve and become resistant to the modification in a matter of years. We would have to start all over again. Either way, finding a solution is imperative. Perhaps one day in the near future, there will be a way to target the NDM-1 enzyme directly without having to go through antibiotics. Or perhaps this discovery will lead to even more sustainable solutions to antibiotic resistance.